Vegetable Pasta and a ‘lil Chicken, too! Hi Everyone! It’s been a while, but not because I haven’t been shopping and cooking. I do all that on a regular basis, but with work taking up most of my day, I don’t always get to share new ideas with you. Here’s a quick recipe that can be meat-free (for our Lenten observance) or just because! It’s nothing new and the possibilities are endless. Bring a large pot of salted water to a boil. 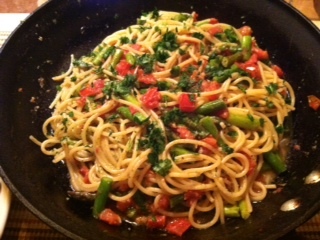 While the pasta of your choice is cooking, heat 2-3 tablespoons of olive oil in a skillet over medium heat. At that point, the choice is yours. Tonight’s pasta was chopped fresh asparagus (about half a bunch), 3 diced Roma tomatoes (they only seem to have any flavor when they are cooked), a few cubes of defrosted homemade pesto (see other posting), a couple of chopped garlic cloves, and a sprinkling of chopped Italian parsley, salt, pepper, and red pepper flakes. Heat the oil – add the asparagus for a few minutes. Toss in the tomatoes and garlic, and be sure to salt/pepper each addition. When the pasta is ready, scoop it right from the water into the skillet. Add in the creamy pesto and toss together. You can add a ladle or two of the salted pasta water to help with the texture, if desired. Top with chopped parsley and grated Parmesan cheese and you’ve got a delicious and very easy dinner. 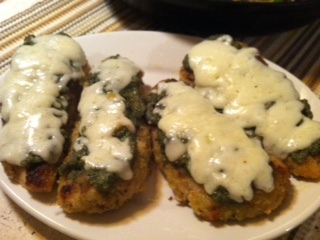 Also pictured here are some previously cooked (breaded/baked) chicken tenders with pesto and mozzarella. (Add whatever you have on hand to the pasta. If you don’t have pesto handy, a couple of ladles of vegetable or chicken stock will add some great flavor. Buon Appetito!